inscription: Printed in black below text is, "Committee for the promotion of Selective Youth in Asia [satiric homonym for euthanasia]." Bottom left corner has a black rectangle with VHM in it. 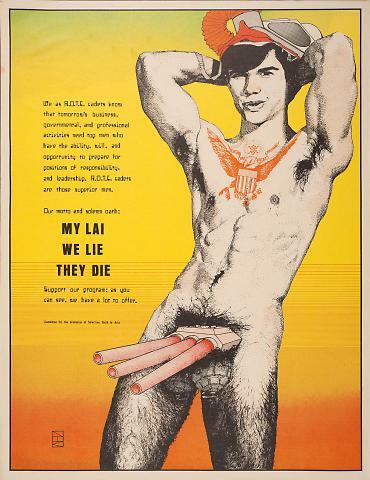 Poster has a background that fades from green to yellow to orange with an image of a muscular man on the right. The man is naked except for a gas mask on his head and an orange eagle tatoo on his chest. In the man's groin area is a tank with three guns and two grenades hanging below the tank. The poster reads from top to bottom in black, "We as R.O.T.C. cadets know that tomorrow's business, governmental, and professional activities need top men who have the ability, will, and opportunity to prepare for positions of responsibility, and leadership. R.O.T.C. cadets are those superior men. Our motto and solemn oath: My Lai We Lie They Die. Support our program: as you can see, we have a lot to offer." The artist VHM could possibly have produced this as part of the Berkeley 1970 Workshop.